Heat oven to 375°F. Lightly spray 11x7-inch baking dish or other 2-quart casserole with cooking spray. Spread 1/2 cup marinara sauce (from 24-oz jar) in bottom of baking dish; set aside. In medium bowl, stir together 1 container (15 oz) part-skim ricotta cheese, 1/4 cup grated Parmesan cheese, 1 cup shredded mozzarella cheese (4 oz), 1 teaspoon Italian seasoning and 1/2 teaspoon garlic powder. Cut 3 to 4 large zucchini into 1/8-inch slices. Layer 5 zucchini slices on microwavable plate; microwave uncovered on High 30 seconds. 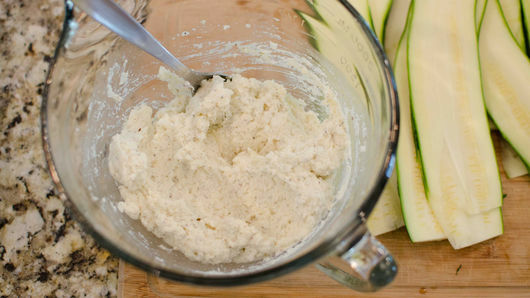 Immediately spread 1 1/2 tablespoons ricotta filling onto each of the 5 zucchini slices. Roll up each slice; place seam side down in baking dish. Repeat with remaining zucchini slices and filling. 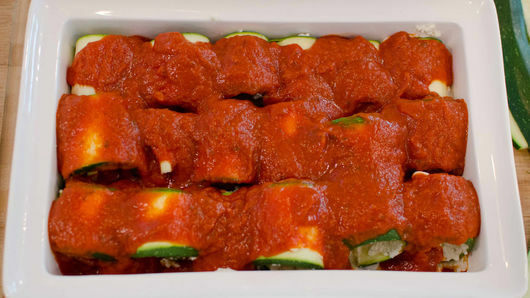 Spread remaining marinara sauce from jar evenly over tops of zucchini rolls; sprinkle with 1 to 2 cups shredded mozzarella cheese (4 to 8 oz). Top with 1/4 cup grated Parmesan cheese. Bake about 25 minutes or until golden and bubbly. Let stand 10 minutes before serving. Make sure to slice the zucchini thin! The thinner they are, the easier they roll. 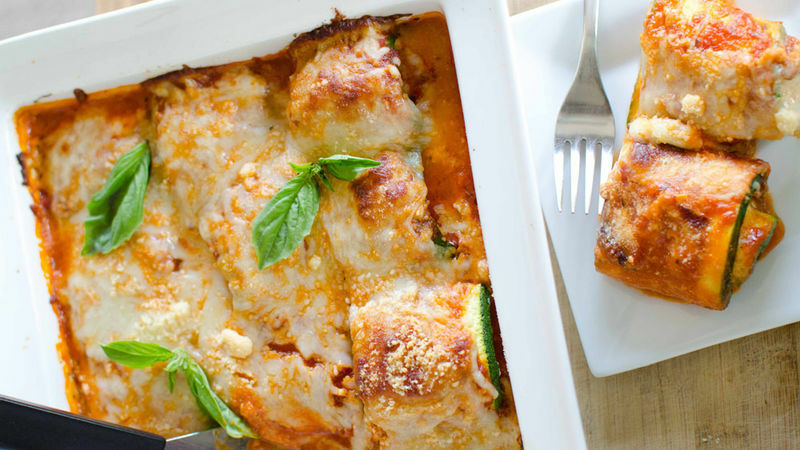 To make this a heartier meal, add cooked and crumbled Italian sausage or ground beef to the rolls. 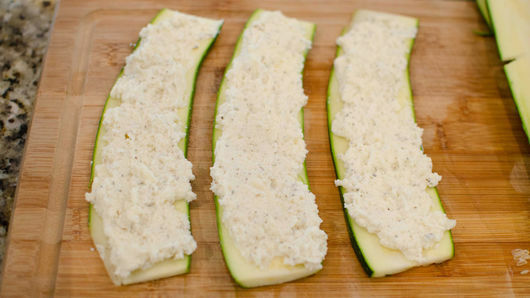 Spread over the ricotta layer before rolling the zucchini.